LOTTE WORLD SEOUL SKY – Sky Shuttle refers to the ultra-high-speed elevators for Seoul Sky, the world’s 3rd highest observatory. The elevators travel from the second basement level to the 123rd floor of Lotte World Tower within just a minute. Sky Shuttle’s innovation lies in the fact that its four sides are all media walls. Despite the fact that elevator core penetrates Lotte World Tower right in the center, being inside the elevators feels like being surrounded by glass walls. The media walls aim to provide a unique experience for the journey up to the observatory. 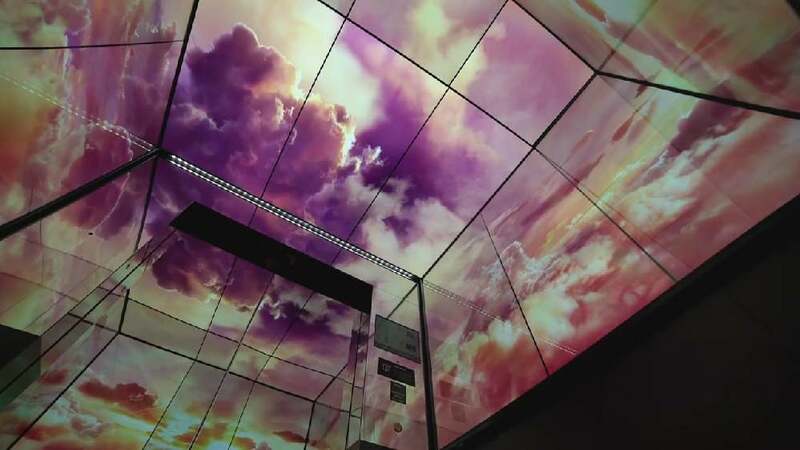 Each surface has 15 large liquid crystal displays (60 in total), while the medial walls play VR videos that maximise viewing pleasure and experience. Going upwards, viewers experience the landmarks spanning Seoul’s distinguished history as a capital city, how the city has changed, and a time-lapse of the building of Lotte World Tower. On the way back down, 3D animation technology makes it possible to display night scenes and fireworks around Lotte World Tower. With media walls on all four sides, Sky Shuttle represents innovation and function. From a functional perspective, Sky Shuttle is highly concerned with user convenience and safety. The average adult height and viewing angles are reflected in the organisation of the interface, the durability of the media wall material have been thoroughly considered, and safety issues in the installation and operating stages are carefully managed from the early planning stages.